CAMARILLO, Calif., June 14, 2018 – Semtech Corporation (Nasdaq: SMTC), a leading supplier of high performance analog and mixed-signal semiconductors and advanced algorithms, announce that Kiwi Technology Inc., a provider of comprehensive solutions and services for the Internet of Things (IoT), is dedicated to implementing Semtech’s LoRa devices and wireless radio frequency technology (LoRa Technology) to maximize energy resources and reduce operational costs in smart cities. 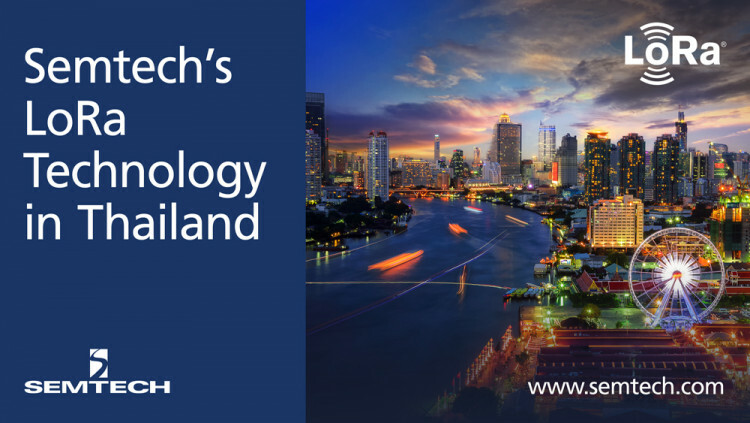 Kiwi Technology collaborated with Precise Digital Economy (PDE), Thailand’s largest electricity facilities group, to increase production for IoT-enabled devices. The project is one the first of its kind for Southeast Asia, and is aimed at developing a smart city network of LoRa-based sensors to better regulate public utilities including electricity. Kiwi Technology has also distributed LoRa-based solutions in China, Indonesia, Japan, Taiwan, and many other countries. Founded in 2002, Kiwi is a leading company that focuses on A/V streaming, networking and communications. Recently, Kiwi has cemented itself as an IoT leader in Asia, and is committed to solutions that are innovative, sustainable, and community-oriented. Kiwi Technology provides comprehensive solutions and services for the Internet of Things, including smart factories, smart agriculture, smart shopping malls, smart power systems, smart meter reading, smart asset supervision, smart parking, smart street lighting, smart waste management, smart buildings, and other industries. For more information, visit www.kiwi-tec.com/en/. All statements contained herein that are not statements of historical fact, including statements that use the words “bringing,” “will,” “is becoming,” “designed to,” or other similar words or expressions, that describe Semtech Corporation’s or its management’s future plans, objectives or goals are “forward-looking statements” and are made pursuant to the Safe-Harbor provisions of the Private Securities Litigation Reform Act of 1995, as amended. Such forward-looking statements involve known and unknown risks, uncertainties and other factors that could cause the actual results of Semtech Corporation to be materially different from the historical results and/or from any future results or outcomes expressed or implied by such forward-looking statements. Such factors are further addressed in Semtech Corporation’s annual and quarterly reports, and in other documents or reports, filed with the Securities and Exchange Commission (www.sec.gov) including, without limitation, information under the captions “Management’s Discussion and Analysis of Financial Condition and Results of Operations” and “Risk Factors.” Semtech Corporation assumes no obligation to update any forward-looking statements in order to reflect events or circumstances that may arise after the date of this release, except as required by law.